Each year CHIU conducts several fundraisers, including an annual benefit dinner and a cookout. Please contact us for information regarding the next event. CHIU's Annual Mission trip to Uganda has been scheduled for January 7-12, 2018. For more information or to sign up, call CHIU: (781) 222 3663. 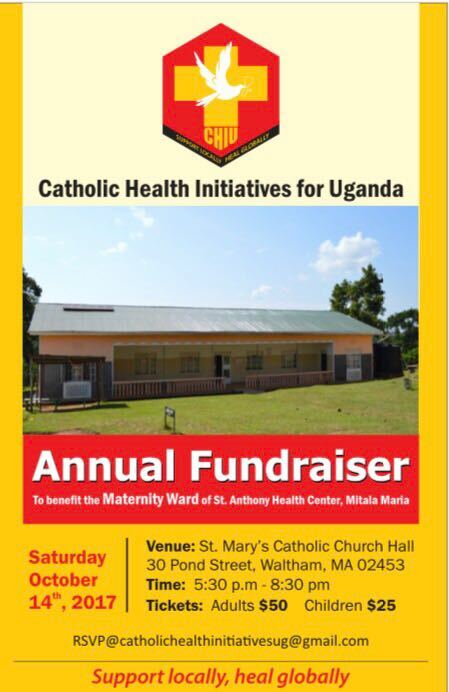 Proceeds from the fundraising dinner will go towards the facilitation of the maternity ward of St Anthony Health Centre, Mitala Maria, Masaka, Uganda and medical supplies for the medical mission trip to the Centre taking place on January 8th - January 12th 2018. Join CHIU for its 4th Annual Fundraising Dinner. It will begin at 5:30PM. Tickets are on sale at St Mary's Parish Church or Call Miria at 781-222-3663. Join CHIU for its 3rd Annual Fundraising Dinner. It will begin at 5:30PM. Ticket information coming soon! Join CHIU for its 3rd Annual Cookout. More details to come! CHIU will be organizing a fundraiser yard sale on April 23 at 9AM to 2PM. Donated items for the yard sale can be dropped off at the St. Mary's Rectory with a note: ATTN: Father David CHIU Yard Sale. Join CHIU in praying for the sick throughout the world. Mass will be at 12:10PM followed by Adoration, Confession and Screenings. There will be a concluding Mass at 6PM with the Anointing of the Sick. In the lower church hall there will be free preventative health screenings and educational opportunities. CHIU's Annual Mission trip to Uganda has been scheduled for January 10-16, 2016. For more information or to sign up, call CHIU: (781) 725-2448. Save the Date! You're invited to CHIU's Second Annual Fundraising Dinner. This is a wonderful opportunity to learn more about the mission of CHIU. The evening will also consist of live and silent auction and entertainment. Location: St. Mary Parish Hall on Pond st.
Join CHIU for a friendly cookout! It'll be on Saturday, June 27th on the lawn of St. Mary's.